Another surviving member of the Saturday Morning cartoon wars has passed on. Lou Scheimer, who helped found Filmation with Hal Sutherland, passed away at the age of 84 Thursday, as first reported by Cartoon Brew. Filmation had a fierce rivalry in from the late 1960’s through the 1980’s with William Hanna and Joseph Barbara of Hanna-Barbera Productions. From roughly 1967 to 1982, Filmation and Hanna-Barbera supplied the three major networks with the bulk of animated children’s series to the three major networks to the Saturday morning daypart, then a major cash cow. Born in Pittsburgh, Scheimer began his career working in art studios and animation houses, including Walter Lantz, Larry Harmon Productions, and Hanna-Barbera. He opened Filmation in 1962 with Sutherland and later was joined by Norm Prescott (who died in July 2005.) The firm mainly did TV commercials, but ventured into children’s animated series with an animated version of Superman in 1966. Filmation then struck gold two years later with its successful adaption of Archie comics for Saturday morning TV, which ran for years. Of course, there were some misses too: The Adventures of Waldo Kitty, Ark II (live-action), The Tom & Jerry Comedy Hour (a 1980 revival), and Gilligan’s Planet to name a few. One aspect of Filmation’s production is the “rotating credits”, seeing Schmeier’s and Prescott’s name rating in a circle, where as they would get equal billing as executive producers. While Hanna-Barbera, Ruby-Spears and others went full speed into the 1980’s, the number of series Filmation produced actually dropped, and with the sale of the company to Westinghouse Broadcasting (Group W) in 1981, focusing its efforts in developing first-run syndicated children’s animated TV series. When Filmation and Group W launched He-Man in 1983, it became the first syndicated first-run animated early fringe (afternoon) strip, whose template became a cash machine for independent stations throughout the 1980’s and 1990’s. Unfortunately for Filmation, they were unable to capitalize further as bigger players such as Fox, Disney, and Warner Bros. took control of the increasingly lucrative weekday daypart. 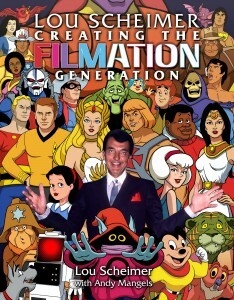 When Filmation was trying to return to syndication with Bugzburg in 1989, Group W sold the studio to investors of a French cosmetics company, who promptly closed it (“put down your pencils and get out” is what one Filmation staffer allegedly heard) and the series – which cleared 90 percent of the country for a September 1989 debut – never went forward. Filmation’s former sparring partner (Hanna-Barbara) was sold to TBS in 1991 which in turn, sold to TimeWarner in 1996 and was folded into Warner Bros. Animation. Schmeier formed his own animation company after Filmation closed, but was unable to sell any projects and closed his studio in 2004. By this time, the children’s TV business had changed considerably as it was no longer profitable as it used to be. Broadcasters bailed out altogether, save the three-hour E/I block on weekend mornings. Yet another reminder of how the industry has changed came last week when WLS-TV announced it was expanding its weekend morning newscasts – again. Today, news reports of shootings, accidents, and fires – not to mention mindless infomercials and boring lifestyle shows – have replaced cartoons and other kid-targeted programming as Saturday morning staples. Most of Filmation’s library now rests with Classic Media, which was purchased earlier this year by DreamWorks Animation. Exceptions include Filmation series featuring Tom and Jerry, Batman, Superman, and Gilligan’s Planet (Warner Bros.); Mighty Mouse, The Brady Kids, and Star Trek (CBS); and Flash Gordon (Hearst). As an added bonus, here is Lou Schmeier’s final appearance, appearing at a panel at Comic-Con San Diego in 2012, discussing how he formed Filmation Associates.